Back in November my husband bought himself a Sphero BB-8 app-enabled droid. He picked it up off of Amazon.com. At $150USD it wasn’t exactly a cheap purchase, but he had some Amazon credit saved up, so it was sort of free. I mean I could have talked him into using the credit for something less frivolous, but it’s nice to splurge sometimes, right? 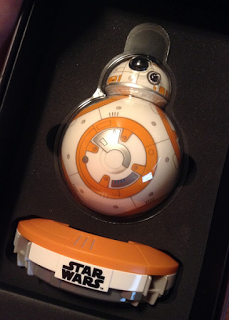 I knew my husband had been eyeing the little droid since Sphero first announced that it would be released. And, well, let’s just say I didn’t exactly discourage him from buying one. I really wanted to check the darn thing out. The BB-8 Sphero looked like something I had dreamed of owning as a kid. Little semi-autonomous robot thing? Heck yes, please. However, the reality of the toy was not quite what I had expected after watching the promotional videos. The truth is BB-8 was a big let down. My husband and I were both disappointed with it, and I’m only glad this was a silly splurge purchase and not the “big thing under the tree” this year. The voice activation portion of the app is so-so at best. Sometimes it recognizes voice commands, sometimes it doesn’t. I’d say the voice commands work about 60-70% of the time. The packaging claims BB-8 learns and develops. “Adaptive Personality // Your BB-8’s unique attitude and actions evolve as you interact.” Well, that’s a pretty vague statement. Perhaps our BB-8 has been evolving and changing in subtle ways that I haven’t noticed. However, it doesn’t feel like it. We’ve owned BB-8 for over a month and it doesn’t seem like it’s learning at all. My kid’s Furby has probably evolved and changed more than this thing (and that’s not saying much). It doesn’t really do much on it’s own. In the one promo video they put out they show BB-8 paroling autonomously on a table top. This is highly misleading as he doesn’t sense edges, and would likely plummet to his broken into bits doom if actually unleashed to run free on a table. I have found the autonomous patrolling in general to be a disappointment. BB-8 just basically randomly rolls around and gets stuck very easily. This goes back to the whole I don’t believe it’s learning or adapting thing, unless what it’s learning is to get stuck in the same spots over and over. The holographic messages are also a huge fail. They do not project from the droid itself, but rather are a form of augmented reality. If you look at the droid through the camera on your phone and line it up just right the visual on your screen will make it look like there’s a hologram being projected from BB-8. This may look better on a tablet. On the small screen on my husband’s iPod touch the video is pretty much unwatchable, and lining everything up so that it looks like the hologram is actually coming from BB-8, while still leaving enough room for it to project, is an exercise in frustration.For me Sphero’s BB-8 completely fails in the categories of Adaptive Personality and Autonomous Behavior. If you want to think of it as a sort of remote controlled robot puppet, it could be a win. However keep in mind that any “speech” or sounds that come from BB-8 actually emanate from the phone or tablet you are controlling him with, and not the droid itself. The droid can not see. It does not have a camera in it. It can not hear. It can not make sounds. It can roll around, bump into stuff, and dart it’s head about in a cute fashion (well, when it’s head isn’t falling off, which tends to happen when it bumps into stuff, a.k.a frequently). Overall we have found Sphero’s BB-8 to be more frustrating than fun. Once you get used to the controls you can run BB-8 around, sort of like a bleepy remote controlled car. I suspect a child who received this little droid as a gift would likely be disappointed, unless what they were hoping for was a robot puppet to remote control. (From what I’ve heard if what you want is a remote control droid to drive around Hasbro’s BB-8 is a better bang for your buck, but I haven’t tried that one out personally yet. )What about you folks? Have any of you had a chance to play around with Sphero’s BB-8? Is there something fantastic about this toy that I’m just missing? or do you agree that at $150USD it’s not worth the price tag? How unfortunate! A very expensive toy that does not deliver. Hopefully your post will enlighten anyone who was planning to buy one as a gift or even for themselves. So disappointing. Yes! I think if what you're looking for is Sphero #2 this is a solid choice. If you're expecting an autonomous droid you're going to be sadly disappointed. I would like to point out that you did that whole post without a "this is not the droid your looking for" joke. I'm disappointed in you.Really though, sounds like a big letdown. I probably wouldn't buy one unless it was something one of the kids wanted. I do think it's awfully cute. But I like your honest review- very refreshing. We also got one for Christmas and like you, were highly disappointed. I would not recommend buying this unless you could get it for well under $100. I am SO glad I read this because I was thinking about getting my teenage son one for Christmas, he would’ve been so disappointed! Hmm, I’m glad I didn’t invest in one for my grandkids! Thanks for all of the info!